What do you expect from the biggest, most tech savvy information technology corporations when you enter the world’s fastest growing web member community with 55 million visits every month? 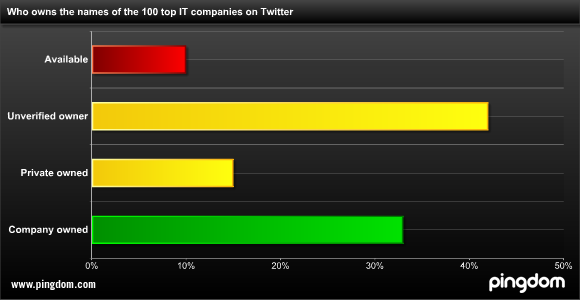 We did a small Pingdom poll, looking at the Twitter presence of some of the world’s 100 biggest IT companies. You might expect the possibility to find a clear company representative with a quick search on the site. Given that Twitter is a community where frustrations are publicly vented and often spread at light speed between users (see the Pingdom post about outages) you might even wish for a company representative with the ability respond to disgruntled customers. 10 of the names of the world’s biggest, most knowledgeable IT companies were still not registered in April 2009. (We have notified them of this). 42 of the accounts were occupied by anonymous users, presumably individuals. 15 of the accounts were clearly in the hands of individuals. 33 of the accounts seemed to be used by the company in question. On Twitter, companies like IBM, Dell and Microsoft have several tens of different accounts, but no easily discernible main account. Sometimes, like in the case of Microsoft, remarkably few of the many company accounts bear the company name and so they are hard to find. Companies famous for suing everyone and everything even close to their brands like Apple here have their name on the account of an anonymous person tweeting that he likes apples. Very clearly, Twittersquatting (individuals choosing to take brand names, similar to domain-, or cybersquatting) seems very common, and Twitters current rules do not seem to have changed this. 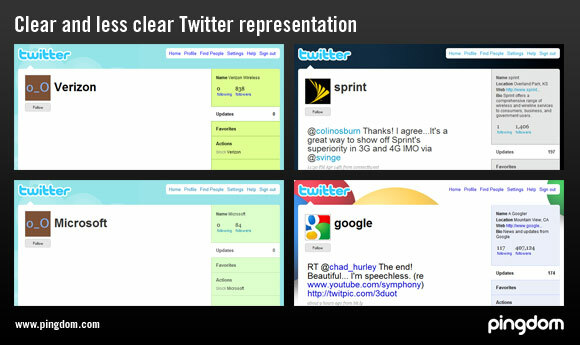 Above: Competing companies, some of whom raise quite a bit of emotion on Twitter (search Verizon, for instance) have chosen to be represented in different ways. We suspect Google might have got this one right, given their 400,000 twitter followers. At Pingdom, we are quite aware of the difficulties that a bigger micro-blog presence can pose in terms of a pressure to respond quickly to many questions. We do not endorse any kind of name squatting and we do not claim to have all the answers regarding corporate communications in the age or micro-blogs. All we can say is that if you have a brand to protect, you should probably register it right away. Do you think more companies will try to control their names? And that Twittersquatters will benefit? Will Apple sue mr Apples? Let us know by commenting below. We took the biggest US IT-companies from the eight IT/Tech/telecoms categories of the Fortune 500 2008-list, total: 92. We then added eight big non-US IT-companies to get 100 top tech companies. During the 15-17th April we searched for Twitter accounts and checked availability with their company names as defined in the chart above. Twitter allows fifteen letters, and abbreviations have been necessary. Categorization is based on our judgment of the account credibility as a company representative (logos, links, names and news). In a few cases, “Unverified” also included accounts that weren’t found, were suspended or had technical errors – but they were not available for registration. These businesses all have more to do with their time than to chase down every sm for their brand. I would much rather Ericsson work to make better cellphones than to be available on Twitter. That said, the marketing and legal/contract departments should have a compliance and copyright person who chases this stuff down. I don’t see this as their failure to recognize essential technologies, but rather it provides us with a look at how much time and effort they are burning on just meeting their business objectives. I think there is a back-story here for a continued need for Social Media and Community Managers to assist these organizations. Maybe not as a full-time effort, but definitely as a revolving contract. Exactly what would a large tech company hope to achieve with their corporation Twitter presence? A little bit of PR? A little bit of tech support? Don’t their multi-million dollar efforts elsewhere also impact Twitter users, or are we assuming that those who Twitter don’t watch TV, read newspapers, magazines, or other website? Would a continuous stream of Microsoft tweets defending Windows Vista have made any difference? Has anyone, anywhere, ever bought a PC, a cellphone, or other expensive gadget because of a tweet? There might be 55 million registered Twitter users, but every time I go through my lists, I see dozens whose last activity was several months ago, and even among active users, recent studies have shown that they only interact with their real friends, which means 15 followers, not 1,500, and none of them are corporations. I see here in some of the responses a degree of cynicism about corporate use of social media to communicate to a broad audience. At Cisco, we integrate social media technologies to develop more direct two-way customer conversations. This enables us to gain feedback to drive initiatives such as EnergyWise to help enterprises reduce their carbon footprint, virtualization to create a more operationally efficient data center architecture, and the ongoing drive to spur more migration to IPv6. We noticed early on that many of the IT professionals we communicate with grew up immersed in social media. The use of Web 2.0 technologies has proven effective for us to successfully interact with these folks. For example, I’ll be video blogging directly form the exhibit floor during Interop starting May 17. I think the reality is that for many people video has become the new email. And yes, we also like to tweet, too·it works! Jennifer Geisler, Manager of Network Systems Networking and Switching for Cisco.